This week held Midsummer’s Eve; the Summer Solstice; the year’s shortest night followed by the longest day. Here in Enchanted Habitat this marker of Earth’s cycles came and went almost unremarked, as it always does. Well, no, the TV weatherpersons do always mention it. And Wikipedia told me Unitarian Universalists celebrate the summer solstice as a religious holiday. But to my knowledge there were no bonfires here with leaping, dancing, and chanting pertaining to the fecundity of nature; and if ever there have been, nobody told me. It was only this year that I first realized that we, here, as an overall culture, are among those who ignore the Summer Solstice. When I did think about that (who knows why?) I was disappointed in us at first, but then I got curious. Why is it that we don’t get excited about Midsummer? Here are some facts I found out. They don’t answer the question, but I think they’re interesting. European Christianity attempted to bring the great ancient pagan observance of Midsummer under rule and call it St. John’s day. Virtually all of the Western and Eastern European countries’ and Canada’s local populations celebrate Midsummer/St. John’s Day in their own various ways, usually including a big bonfire. 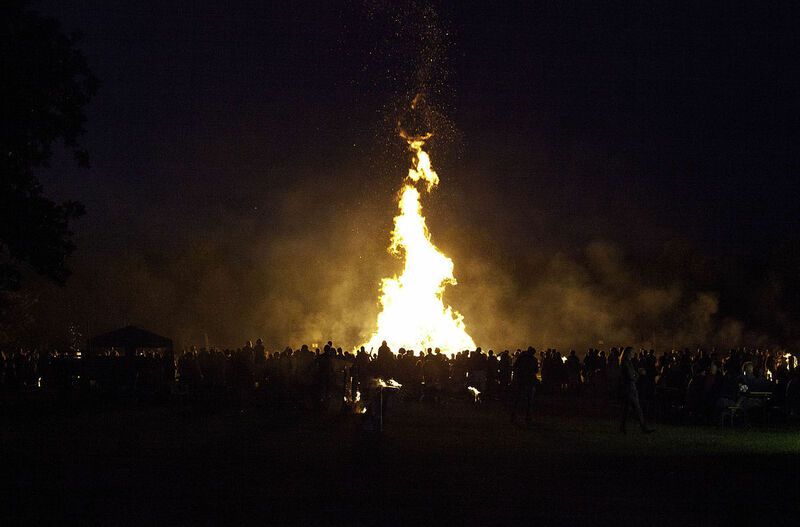 The specific purpose of the bonfires, nowadays, is whatever one wants it to be, the meaning is unspecified. Unspecified, because one wouldn’t be wanting, nowadays, to say it’s to keep away the dragons/bad luck/evil spirits/witches. Wikipedia listed a few locales in the U.S. as having their own more-or-less-institutionalized observances. None of those places is near here. Back to the question of Enchanted Habitat’s seemingly-inexplicable indifference to Midsummer. We here are certainly not lacking in archetypal knowledge and tendencies. Scratch a native-born central Arkansan and you will find a secret streak of ancient psyche every time. Secret even from the owner. And that, I conclude, is the answer to the question. Who we really are runs too close to the surface. We dare not turn our real selves loose at Midsummer, and therefore we don’t even think of it. This apparent moonscape is part of my backyard. The photo is cropped from a broader area showing probably a dozen of the round holes. Each hole is small, about the size of the tip of your little finger. They are bumblebee holes. At least I think that’s what the bees are. 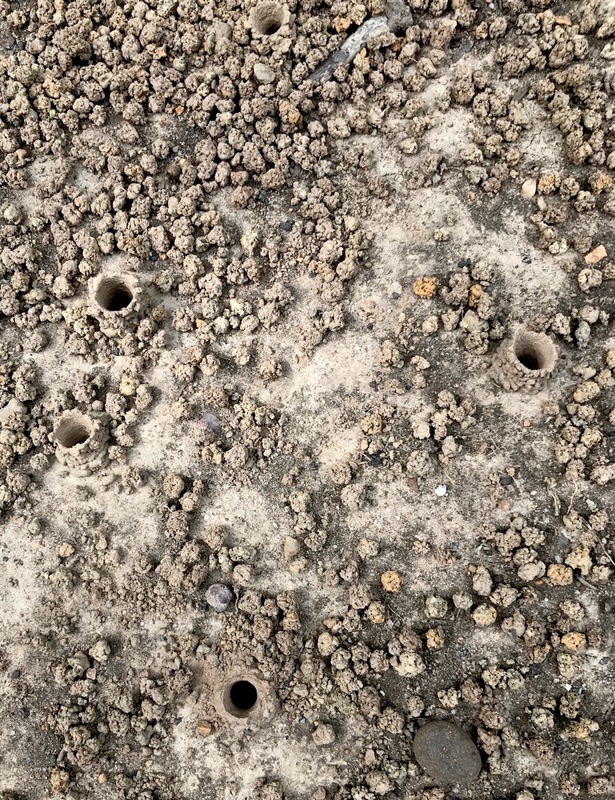 If you stand and watch the holes for ten minutes, you will see what appear to be bumblebees arriving one at a time and then cleverly disappearing headfirst down a hole that seems too small for it. Soon you will see a bee emerge and lift slowly up into the air and then zoom off fast, like a wee fuzzy jet plane. I’ve seen this all my life; it’s a common sight here. Always, I’ve assumed each bee has its own little house, does its own thing. Now I’m wondering if all those little houses are connected down there under the earth. From what I can read without devoting my life to it, there are many many kinds of bumblebees, and all are colony creatures, and the members of a colony live together and have a queen, etc., same as honeybees only not so organized. And nowhere in my reading have I found a reference to single little holes near each other in the bare dirt. If any readers know the answer to what’s going on down there, or not going on, kindly enlighten us. My second underground friend, here, stays at least part of the time in this hole. 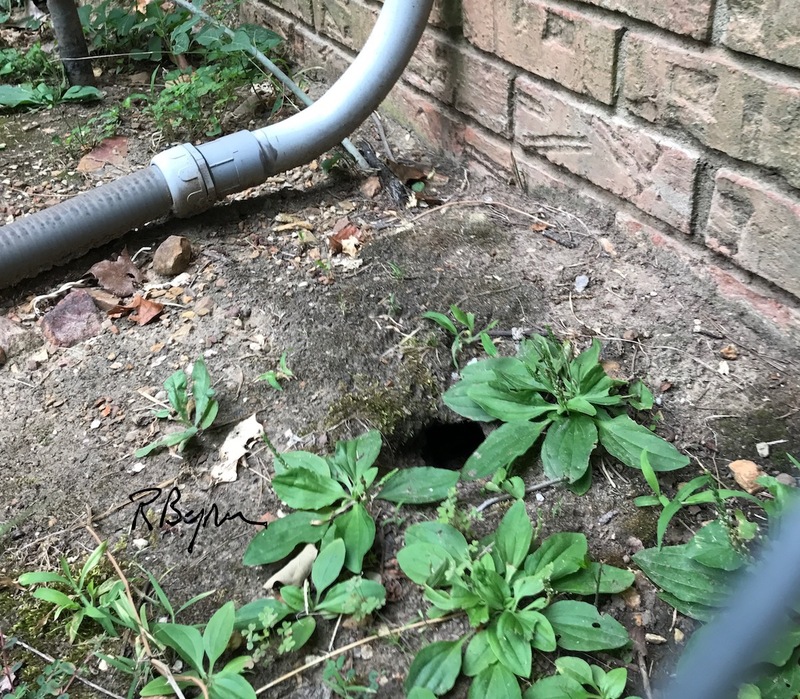 I think the hole goes all the way under the house. If you guessed chipmunk, you get a blue ribbon. I think he’s the same one who has another hole near the fence. That one, he has to defend. I’ve seen him attack a full grown squirrel that came too near that hole. Mr. C. Munk likes to use the patio as a shortcut on his way here and there, no matter that we scare each other all the time. This is how I found out that chipmunks scream. I read that their screaming helps them elude predators by surprising and confusing them. I think someone made that up. They probably just scream when they’re scared, same as we do. My friends will tell you I will never eat outside if I have a choice. I’m very interested in fauna, but not in my food. 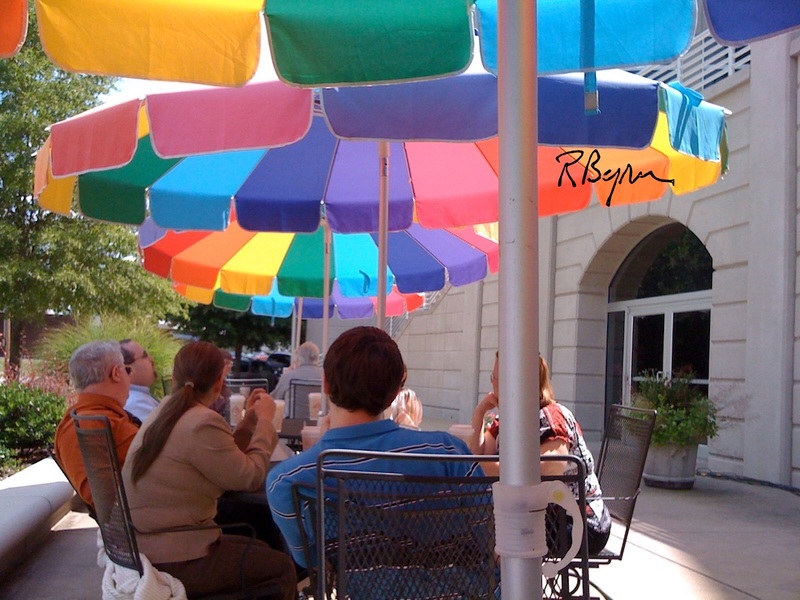 I included this picture because other people say they like to eat alfresco. Enjoy!